Tell us a little about yourself and how you first got involved in the scribal arts in the SCA. Did you have artistic experience prior to this involvement that has helped you? 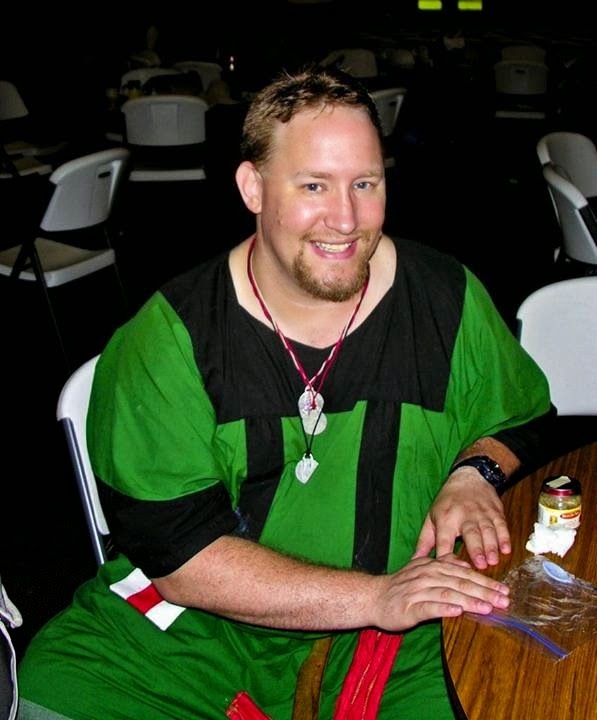 Hello, I am The Honorable Lord Ian the Green a mid 13th century scribe from Scotland. I currently live in the Middle Kingdom, but I got started in the Barony of Eskalya, Principality of Oertha the West Kingdom I have also lived in the Kingdom of Northshield where I married my lovely wife. Interestingly my only award for Calligraphy was my Award of Arms. It says for Calligraphy, Fencing and Service. My award of arms level Science Award (Order of the Silver Oak) was for ink making and helping with period games. My Grant of Arms level Arts and Sciences award says it is for ink making and teaching calligraphy. I had Art 101 in college where I mostly used pastels and sculpted a sandal from a toaster waffle. No, I'm not kidding. Of course I also had art classes throughout primary and secondary education. The class that helped the most was my 8th grade art class. The teacher taught us the importance of trying things out and testing things out and to not be afraid of things that came out a different way that we anticipated. Some people call this failure, but if you learn something from it, then you have succeeded. Maybe you don't want that this time, but another time you might want that result. Also if you see it in the future you will know what caused it and hopefully how to fix it. And you will know what to avoid so that you do not get results you don't want. Of course don't experiment on a final project, do it on scrap and materials set aside specifically for it. In other words PLAY WITH YOUR ART and revel in purposefully doing things not the normal, or right, way! There is no better teacher than to give yourself permission to purposefully screw things up and see what the heck happens. I whole heartedly follow this advice to this day. I am almost exclusively a calligrapher. I also do gilding, layout and am a student of period decoration (that's the painting that doesn't include gilding or other metals,) but I do not paint. I have no problem being a word smith as well. Paper is Bristol Vellum. Ink is my iron gall ink. Pen is either a feather quill or a brausse nib probably .75 mm nib in a mahogany pen holder. Paper, ink and pen. I can do calligraphy just about anywhere I can get a flat surface that isn't shaking horribly as long as I have those things. Can you share a picture of your scribal desk setup for calligraphy? 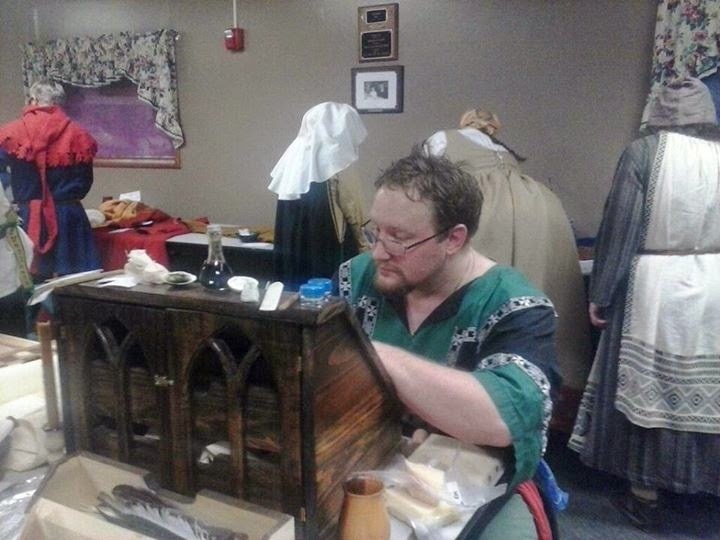 Ian at work on his portable scribal desk. I have two. I currently am working on a full on roll up scroll and I'm using gothic littera bastarda. I just really like the look of it and how it has a hint of the rigidity of gothic but instead is rounded. My first favorite script is Carolingian Minuscule. The reasons for this are somewhat varied, it is fun to write and easy to read. But really the reason this is my favorite script is that I learned it entirely for the purpose of being able to write my girlfriend love letters that she could read. It must have worked, I'm married to her now! Yes, seriously. The first thing I do when I get a scribal assignment here in the Middle Kingdom is to copy and paste it to a word document and create a folder for just this one scribal assignment. I put it into Times New Roman font size 16. Then I try to confirm the recipient's name is spelled correctly by doing Google searches. I also go look up the standard wording in the Middle Kingdom Scribal handbook. I copy and paste that over to the word document as well and then I input the information from the scribal assignment. King and Queen's name, recipient's name and reason for the award. I do this not to have something to copy from but instead to have a matrix to work off of. A foundation to build off of. I then work and re-work the wording until I have something I am happy with and print it out. I then hang it up in my work space so that I have something to go off of the entire time. I then determine if I'm going to use a pre-painted scroll blank or if I'm going to do this scroll without decoration. If I am not using a pre-painted scroll blank then I figure out if I'm going to be using parchment I have made or paper. I work out the design and layout. I love tracing award designs (or other graphics) in pencil, (graphite or lead/tin,) into the middle of the award writing block. Then I draw in the lines for the writing. Once I do that I then trace over it again with the appropriate ink colors in the appropriate places for the award. Then as I write out the award, I change ink color to correspond to the correct color in the award. If that means I stop mid-letter to do a color change, then that is what I do. If a letter goes in an out between a color boundary, then I do the same thing. Examples of this can be found on my Facebook album. Once the ink dries on the award I go over it with a magnifying lens for mistakes. I know most of the ones I've made but I want to be sure I'm not missing stuff. The magnifying lens helps me focus on just that area so I can find a mistake. Generally speaking if I can't see the mistake with the naked eye, I just leave it there. Then I get to scraping any mistakes that need to be fixed. Not all mistakes need to be fixed but those that do get fixed. Some will get scraped with a curved exacto blade. After that I burnish the scraped areas down with a hematite dog tooth burnisher and I pounce the area with gum sandarac. If I need to write more then I do, if I don't, I leave it alone. Then I do the line erasing if I am going to erase lines. Not all awards get the lines erased. According to Christopher de Hamel the best work often left the lines in and the not so valuable stuff took the lines out in period. Then if I have time, I leave it for a day and come back to it with a fresh pair of eyes and fix anything I may have missed. I put the text I printed out on the back using blue painters tape. This way the herald has a gloss to read for court. This has become the standard practice in the Middle Kingdom. Then I take a picture of it, put it in a scroll case/carrier and make darn sure that my toddler daughter can not get a hold of it. The cat doesn't like the craft room so I'm good there. I put the picture into the computer file folder set aside for the project. And off to the event with it after I make sure once again that the scroll is actually IN the scroll case/carrier. I didn't do that once and well, my girlfriend/wife to be got a promissory scroll in court. True story. Tell me about your favorite calligraphy book. I am reading books on medieval paleography - The study of writing - lately. however my favorite calligraphy book is, "The Foundations of Calligraphy" by Sheila Waters a mundane Master Calligrapher and Master instructor. I recommend it highly. The calligraphy book I use the most though is still Marc Drogin's "Medieval Calligraphy, its history and techniques." The ducti are very useful. The danger we fall into in the SCA is to use the book solely for the ducti not the images of period exemplars and forget the read the first half of the book which is wonderful and full of good information. After all we learn about the scribes patron demon Titivilus that way! I am carrying on a tradition started thousands of years ago whose entire purpose is to put markings on a surface for the sole purpose of storing thoughts and knowledge. And I get to do this for people who are getting recognized for the good works they have done! People not understanding the value that the art of calligraphy has. Most completely hand done court scrolls have a few hundred dollars worth of calligraphy and art on them. And the calligraphy is likely the bulk of that value. Practice calligraphy for 15 minutes a day using pangrams. If you want to do more than 15 minutes a day then break it up. 15 minutes in the morning, 15 minutes at lunch. 15 minutes after supper, that kind of thing. Most beginning scribes simply do not have the arm stamina to go for more than 15 minutes at a stretch and pushing past that stamina line will cause bad muscle memory to creep into your calligraphy and thus create bad habits that will be very hard to overcome later. And the aforementioned picture gallery on Facebook. I had flickr for a while but it just wasn't worth their fees and changing things to keep up with it. That there is more scribal work to do out there than just court scrolls. Do you have any examples of your work you wish to share? Order of the Evergreen for Accolon Shadowhawk made by Ian the Green. 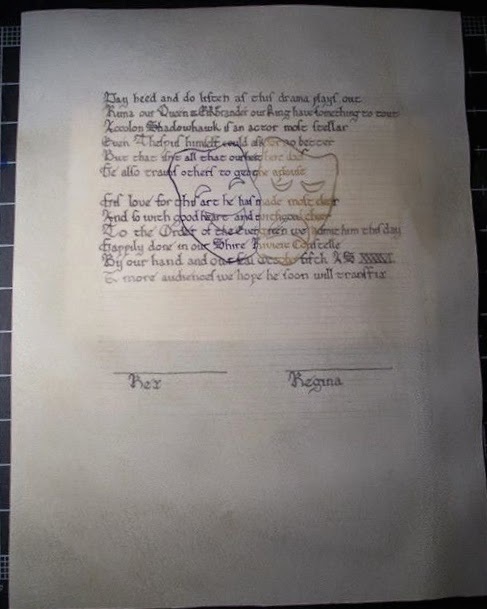 Ian made the goose feather quill, black iron gall ink and parchment for this scroll. The Gold & Purple inks are modern commercial inks by Speedball. Runa our Queen and Eikbrandr our King have something to tout. Happily done in our Shire, Riviere Constelle.